The FLR publishes 4 issues a year, in March, June, September, and December, and occasionally runs special conference issues. Review: Anonymous peer-review, involves a double-blind review of all manuscripts. 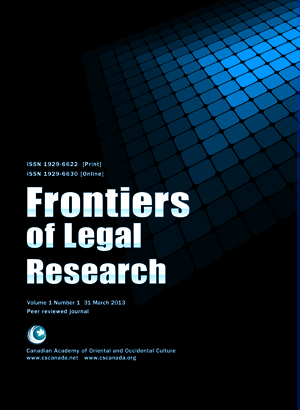 The journal Frontiers of Legal Research publishes articles on any topic of legal scholarship relating to international, comparative law, and legal theory. The FLR aims at becoming a platform for showing developments of law in Canadian, European and international jurisprudence and creates possibilities for communications from different legal systems. A strict and rigorous anonymous peer-review procedure ensures the quality and equal standing of articles submitted by professors, practitioners or students, and a distinctive linguistic policy and expertise gives authors the opportunity to publish their papers in English.